Tagged as: haskell, emulator, lenses. Every year, as part of the SSTIC conference, there is a forensics/reverse engineering challenge. I participated in the 2015 edition. Though I did not manage to complete it, I made an emulator for the exotic ST20 architecture, which is probably worth describing here. Some programs will loop. It’s OK. Note that this emulator is not really optimized for pure speed. In the actual challenge I actually had to rewrite it as pure Haskell (i.e., removing the emulation part) so that it was faster. Instead, the goal of this article is to show a few techniques to write powerful emulators in Haskell. This program uses Template Haskell to define lenses, so unfortunately we need to start with a few type definitions. We’ll represent the memory using a map. The performance is surprisingly close to that of an array. It is possible to get significantly speeds up memory access by using an IOUArray but it turns loads and stores become monadic operations and makes it impossible to use lenses. As we’ll see, transputers (hardware threads) can communicate together. We’ll be able to connect it either between them, or to a tty. The above $(...) is a Template Haskell splice. It creates lenses based on the record declaration of EvalState. Lenses are a very powerful tool that makes it possible to compose record reads and updates in a functional way. Here, it defines a lens for each record field; for example, the splice expands to a top-level declaration iptr :: Lens' EvalState Address. But we will define our own lenses too, and everything will remain composable. Sometimes we will also need to access memory word by word. To achieve that, we first define conversion functions. Then, we can define a lens focusing on a 32-bit value. Those are chainable; for example 0x21 0x22 0x45 encodes LDC 0x125. “primary” instructions such as LDC. Their operand is directly encoded. 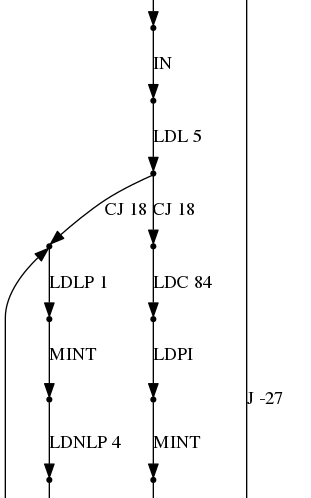 “secondary” instructions such as MINT (equivalent to LDC 0x80000000). They do not have operands. On the contrary, they are actually a special case of the first type, using a special OPR n opcode. For example, MINT is OPR 0x42, which is encoded using 0x24 0xF2. We know enough to draft an instruction decoder. Instruction decoding will need to move within the instruction stream, so it is part of the evaluation monad. > parseSecondary b = error $ "Unknown secondary 0x" ++ showHex b ""
Data is manipulated using two different mechanisms: the integer stack and the workspace. The integer stack is a set of three registers: A, B, and C, which can be used as a stack using these operations. Actually, it can only be manipulated through push and pop operations, so we represent this using a list. The instruction set reference says that an undefined value will be popped if the stack is empty; here we consider that this will not happen, and allow a partial pattern matching. Only the head (A) can be directly accessed, so we first define a lens between a list and its head, and compose it with intStack. The workspace is a place in memory (pointed to by a register wptr) where local variables can be stored and loaded, a bit like a stack pointer. We first define push and pop operations. Then we define a lens to focus on a variable. And these channels can be either a Chan Word8 or a plain Handle, to connect a thread to the process’ standard input and output. We first define a few combinators that will help us define the interpret function. The core of the interpreter is the following function. It takes an instruction and transforms it into a monadic action in Eval. Some cases are very simple. For some others, we can lift them into the host language and use Haskell operations. Others need a few operations to prepare the operands and access memory. Call and return instructions use the workspace to pass arguments. where to read or write the message. 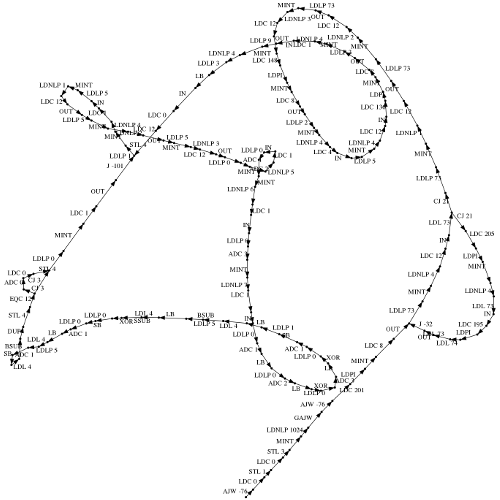 The channel itself is abstracted in the transputer’s channel maps. Most reads succeed; however the first transputer’s channel 0 will read directly from a file, so it will reach end of file at some time. We can detect that when an empty list is read, and exit the process. Several things are missing: the memory map, and how the system boots. Booting a transputer is then just a matter of reading from the correct channel and doing the rest of the evaluation loop. For this problem we have 13 transputers. We devise a way to connect them together. The communication between two transputers is bidirectional, so we need two channels. Each of them is converted to an OChannel on one side and an IChannel on the other one. Booting them is a matter of creating the correct communication channels (this pinout list comes from a schematic that was present in the challenge files). It means that for each transputer, we can choose to print a graph or a disassembly of the code that will be executed. To do that, we will first compute the set of all edges in the control flow graph. This analysis relies on a nextInstr function that statically computes the set of next instructions. These can be reached either because it’s the next one in the instruction flow (DSeq), because of jump (DJmp), or an unknown destination, for example after a RET (DDyn). We can wrap this function in a monadic one that can turn these relative addresses into absolute ones (since it can know the addresses of functions). The fixpoint itself is computed using the following function, which takes a predicate on two EdgeSets to stop the iteration. We’ll stop when their size is equal. Finally, here is how to convert the EdgeSets in a human-readable form. >             edge (x, i, y) = show x ++ " -> " ++ toNode x y ++ "[label=\"" ++ show i ++ "\"];\n"
For example here is an extract of the beginning of the first transputer. You can notice instructions with several destinations (conditional jumps) are displayed twice. The introduction image was done using the same output but an alternative layout engines.